Fortunately, I speak both, so I can monitor that everything is being translated properly... seriously, I once ate at an Indian restaurant. It's amazing what you can pick up in a couple of hours. Also, for those of you who only followed the top few counties during the Olympics, you may be interested to know that India finished the Beijing games with 1 gold and 2 bronze medals. Landing them a 50th place finish, just above Iran. Incidently, the gold medal was won by Abhinav Bindra for Men's 10m Air Rifle. It was the first time that an Indian has won an individual gold since the modern Olympics started in 1896. WHAT WE ARE NOT LOOKING FOR! This week we are headed to Mountain Meadows Church of God. Selina's sister, Kimberly, is singing there this Sunday with Campus Choir from Lee University. This week we are going to do something different by pre-producing the teaching segment of the meeting on video, so members who are unable to attend can still be informed on the content - a request that out-of-towners have been making for a while... I'm just know getting around to seeing the value of it. 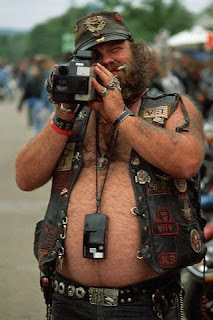 Go figure, I guy with a video background having to be told the importance of video in getting his message out! Technically, since I haven't fully read this book I can't call this a review... so this is a book preview. Yesterday I started my latest read: The Tangible Kingdom by Hugh Halter and Matt Smay. After the first chapter, I love it. I'm trying not to get too excited though... I've had books in the past grab me, only to later disappoint. But, this seems to hold some promise. The book is written by church planters who are taking their version of church in a completely different direction than the status quo (now you see why I like it). They are less about the weekend and more about the home and community - the whole missional thing, which is very popular these days. I'm not ready to ditch the weekend thing... already crossed that bridge in my mind a year ago. But, I do believe there will be some great insight in this read. "When I walk into Starbucks, I don't think about coffee. That's predetermined... tall black Americano. I ponder the lives of everyone I see. I wonder about their spiritual journeys, their highs and lows... and where they look for direction in their search. My initial assumption is that in any room full of people, very few know Christ. I ask myself how I could get into their lives or how a conversation might begin. I don't see them as projects - that wouldn't go very far. I see them as souls the Lord loves who simply haven't seen or heard an accurate message about the Kingdom. I always feel confident that I may one day be talking with them about life and God. Oddly enough, this seems to happen all the time. I've accepted that God has gifted me this way, and I don't expect that everyone will understand or feel the depth of my passion for the spiritually disoriented, nor that my habits of life and engagment will fit everyone. However, I do believe that since you're reading this, you may share something I rarely say out loud: I can't picture any of these people, or my friends, or your friends, going to church... any church... ever!" I've been wrestling with a slogan for The Net. I think I like: "The Net - Church for those who don't go!" Week two of our church hopping experience will be taking us to Journey Church in Hixson, TN. Read some of the pastor's blog and it looks to be a pretty happening place. Looking forward to it! I can't believe I'm posting this stuff... these guys are getting some great free advertisement! A recent news story from Channel 12-CBS: Click here to view video. Yesterday some of the launch team members and friends got together at Riverfront Park. 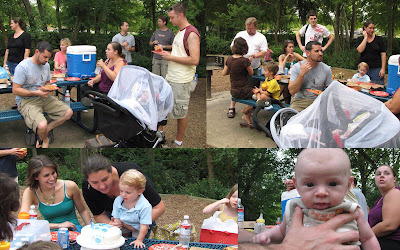 Travis and Kristina organized the event around their youngest son's (Luke) second birthday. They invited us along - for which I am very grateful, because on my own the launch team would still be floundering around on their own wondering if this church they all signed up for was ever going to get together at some point! (That said, we do have our first launch meeting scheduled for next Sunday afternoon). Our afternoon picnic was great. Good weather, great people, and delicious cake! God has blessed us with many wonderful cooks! !